1. Use a Light Box Every Morning! (I forgot last year-won't do that again.) A lightbox is an electronic box that emits 10,000 lux, which fools your brain into thinking that you are underneath the sun. You use it for at least fifteen minutes a day. I have a small one that sits on my kitchen table and I simply turn it on while I eat breakfast and read in the morning. I know it may sound a little weird, but it does boost my energy level, motivation, and mood quite a bit. 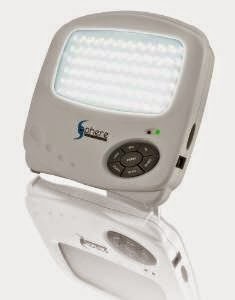 The one I use is called, "Lightphoria," and I got it for about fifty dollars. My only caution is that if you have bipolar disorder, you do not want to use it more than forty-five minutes a day, because than you could become too happy and may end up manic. Aren't those pictures gorgeous? I recommend checking out Oconee Forest Park-it's connected to UGA, in Athens, Georgia. The people were friendly, the trails were mainly level, the grounds were lovely, and it even had a dog park. It could have used better signage, but it's a small detail. 3. Mindfully Appreciate Fall Beauty. Today as I was driving I wondered at an amazing sunset and wished I could have taken a picture. The trees have not yet started changing colors down here in Georgia, but they will soon. The changing leaves, dancing flames in a bonfire, the harvest moon are all a part of fall that are especially beautiful and can be calming if I take the time to notice and fully appreciate them. 4. Self Soothe by Drinking Seasonal Hot Teas & Lattes. Fall is pumpkin spice latte season at Starbucks and Celestial Seasonings Herbal cinnamon apple spice tea at home for me. Tea and coffee make me feel so comforted. Take a sip and then a long, deep breath-you will feel so relaxed. 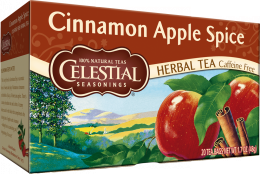 What I like about the cinnamon apple spice tea is that it smells of cinnamon, so it has an extra sensory experience that really helps you settle down. 5. Mindfully Cook Seasonal Food. While you are sipping on your hot tea, get out your seasonal vegetables and prepare a simple crock pot meal or a soup. Besides nourishing my body with good food, I actually feel relaxed while cooking because I put my whole mind into the activity. But then, I already enjoy cooking. If cooking stresses you out, you can skip this one. 6. Look Forward to & Plan a Holiday. Holidays can seem boring if you do them the same way year after year, but having something to look forward to can help bring excitement and pleasure. I am looking forward to attending the Little Five Points Halloween Parade for the first time and to attending a friend's costume party. What's your favorite holiday? Mine is Christmas. So those are my Fall coping skills-do you have any to add? I hope my suggestions help you as much as they help me! these are lovely tips, thank you!